IBM introduced Automation Scripts in Maximo 7.5 as a way to inject scripting code into key system events in order to alleviate the need for Java customization to the product. Launch Points for object-based events, attribute-based events, and action-based events were created to trigger these scripts to run. This gave developers the ability to trigger scripting code within Maximo to fire in the place of the most common methods that custom Java code had been used for previously. As the usage of Automation Scripts has grown over the years, IBM has expanded its Launch Points to include additional events such as various points in the Integration cycle to again alleviate the need to write custom Java code. One commonly used method that has been seemingly overlooked is the add() method in the base Mbo class. This method fires immediately upon creation of a new record in Maximo. There is an option in object-based Launch Points to fire only on the add event, however, that triggers only upon the save event of newly created records – not immediately after a new record is created. In one of the later releases of Maximo 7.6, IBM added an undocumented hook into their code that allows developers to fire an Automation Script upon creation of a new record. This article will walk you through how to do this. To have your Automation Script run immediately upon creation of a new record, you can utilize a little known trick. The script itself will not contain any Launch Points, however, there is code within Maximo that will look for an active script with the name OBJECTNAME.NEW and run it, if it finds a match. 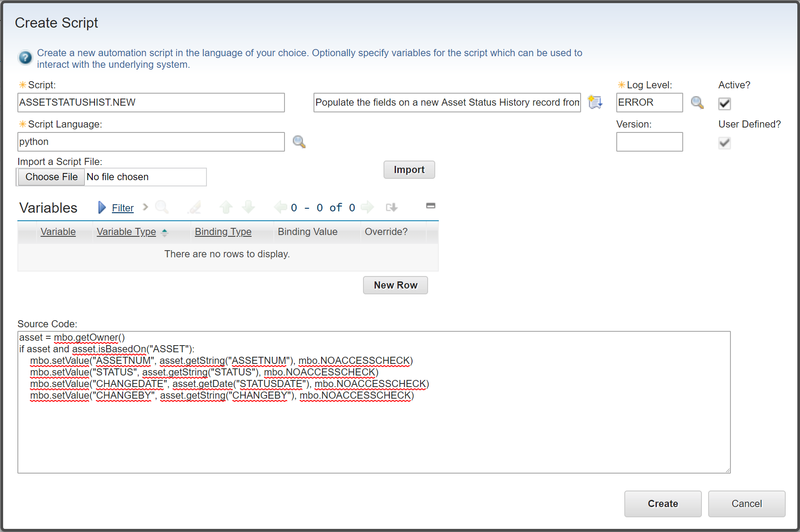 When using this feature, replace OBJECTNAME with the name of the record type, such as ASSET or WORKORDER. Once you have created the script, you will be able to go to the PO application and test it out. Create a new PO with a type of SERV (Service). Next, navigate to the PO Lines tab and select New Row. You will see the Line Type for that row is Service. 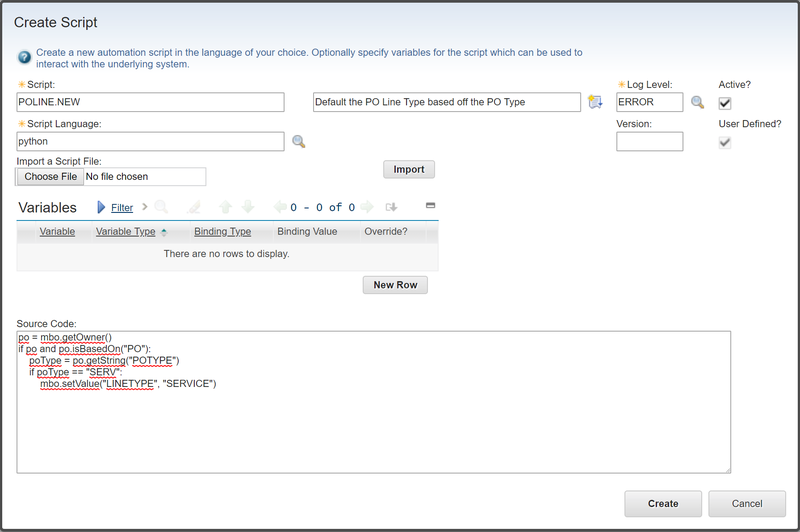 Create another PO record with the type STD (Standard), then select New Row on the PO Lines tab for that PO and you will see the Line Type is Item. Let’s say your users would like to start capturing change history against the STATUS field on Assets, as other similar objects do. After adding a new database object called ASSETSTATUSHIST, you can create a new Automation Script to populate the fields in that table from the parent Asset record. When you add a new row to the ASSETSTATUSHIST table, it will automatically populate with the above values based off of the parent Asset record. That’s it for now! Please feel free to leave any comments or questions below. For visual instruction of the previous steps, check out our video tutorial. Kelly Nimmo is an accomplished Maximo Developer who excels at crafting simple solutions to complex problems. Along with punishing some extremely tough customer problems, Kelly can often be found on the soccer field, demonstrating skills learned as a goalie while at Columbus State University, rejecting foolish attempts to score against her. When Kelly is not at her computer or on the field, she can be found taking orders from her golden retriever pup, Cally, or on the water hunting for the next big fish.